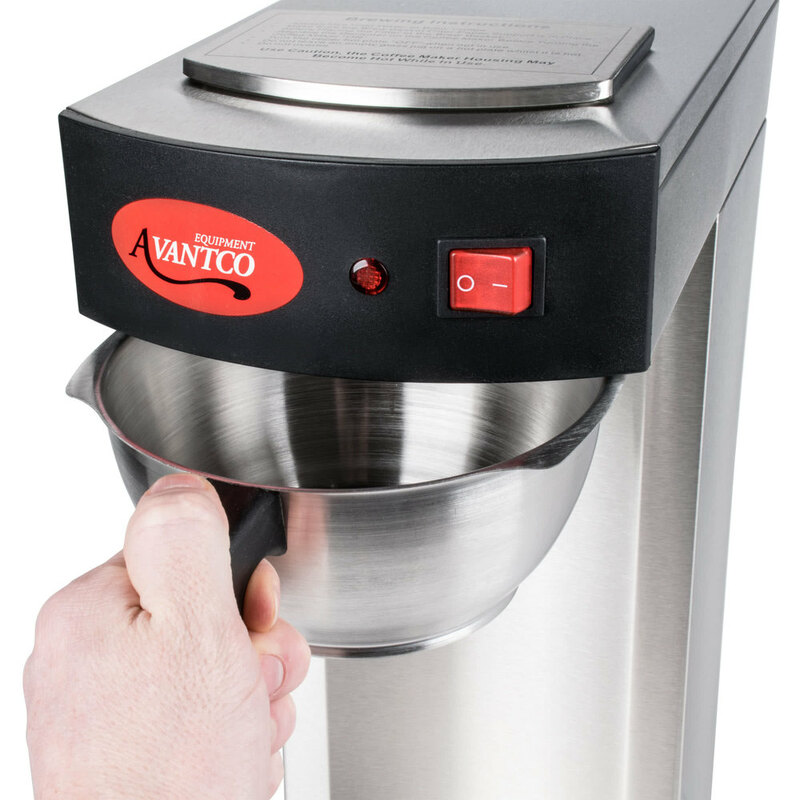 The Avantco C15 pourover airpot coffee brewer is the affordable and durable solution to your coffee needs! 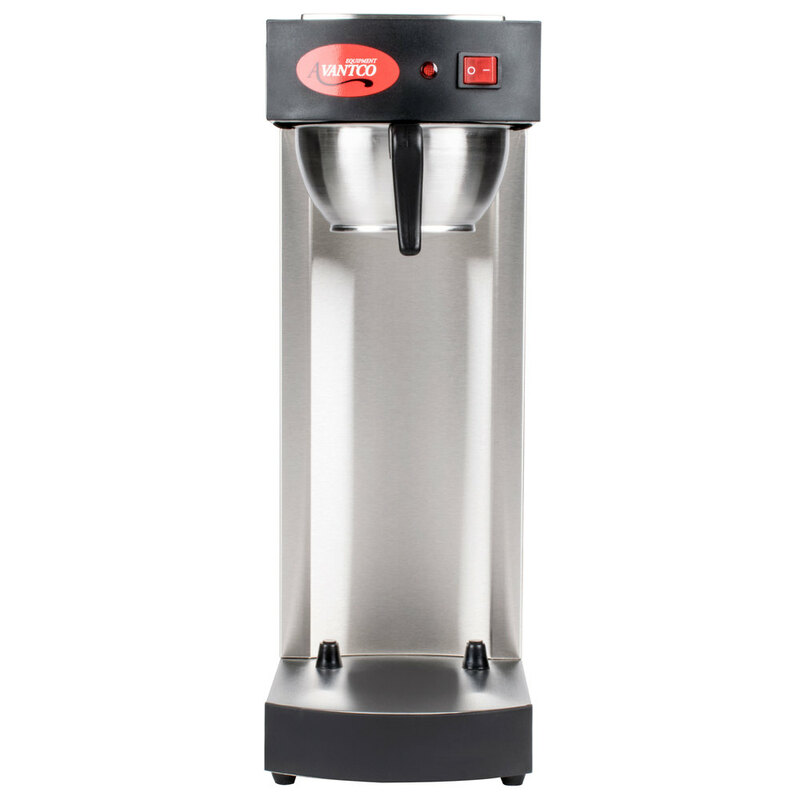 Designed for easy use with simple push button operation, this coffee brewer features a 2.2 liter water tank reservoir. Coffee is brewed at optimum temperatures between 201 and 205 degrees Fahrenheit, and its external stainless steel construction gives it a sleek appearance and makes it easy to clean. And to ensure you can keep up with busy hours, this compact brewer can produce up to 56 8 oz. cups of coffee per hour. 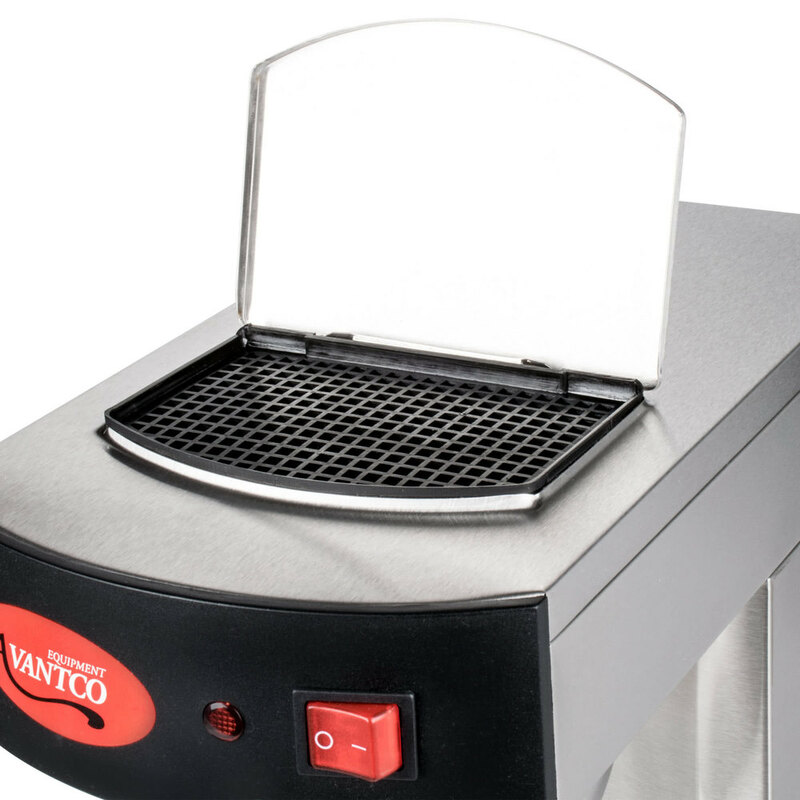 The Avantco C15 pourover airpot coffee brewer requires a 120V electrical connection. Perfect is the word. I was using another coffee brewer and even though I used double of the quantity of the coffee it never came out good. with this Brewer, I use half the amount of coffee and it still tastes wonderful. Decent coffee brewer. Gets the job done. Would be better if at least had a indicator of water level or at least labeled with the quantity of water it takes. 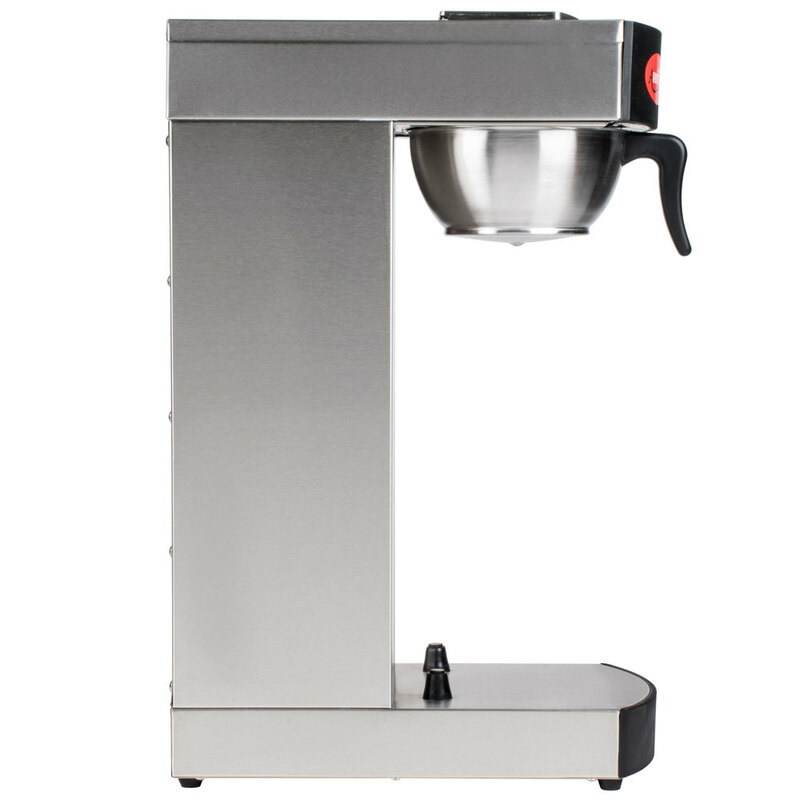 This brewer is compact, easy to clean and use and a great value. Pair it with one of the airpots available from this site and you have a portable coffee brewing solution for all use cases. Makes coffee fast gives off the professional look! But you can only make about 5 16oz cups ( 80 ounces) anything more than that it begins to overflow. It's not fast, but neither is good coffee. I use it to brew for product tasting for my roasting company, tasters and customers are never disappointed. Pour-over temperature is consistent and it's lightweight and portable. Good product at a fair price. Ben H. from Flying Crow Coffee Co. The product works well as previously mentioned it is a little slower than say a bunn brewer but for the cost it does the job. Works well enought for small shops. I buy these for my customers to use in there cafes. As others have noted, slow as can be. Do not believe the times stated in the listing. This thing takes at least 10 to 15 minutes to make an airpot of coffee. HOWEVER, for the price, it works well and is easy to use. At this price, it is perfect for a small needs retailer. If you need to slam out gallons every few minutes, look elsewhere. If you need ~60 oz per 20 minutes, then this is your huckleberry. Brews fast, uses less coffee. Brews hot and consistently. Definitely recommend this product. Great value for the money, Webstaurantstore.com made the decision safe and easy. Used for a month so far. This is great for low to medium volume, but for heavy everyday use it can be challenging to keep up. This may be better for catering. I never thought it would be cost-effective for us to have a restaurant-quality coffee set-up in our office until I found webstaurantstore.com! I was able to get nearly all of our supplies from one site at a great price! Would recommend this item for a very small volume coffee service situation. It works well but takes quite a long time to make a pot of coffee if you are used to one of the higher efficiency machines. The price is very good though so it is worth the money. All I can say is WELL DONE! This Avantco pourover is exactly what we were looking for in our espresso stand. Searched all over for the right size, the right quality, and this has done it. For a fraction of the price compared to others, this does just as good of a job! The stainless and small footprint is definitely worth the money alone! I love this pour over coffee maker, Super easy to use and clean. I can move it anywhere since there is no water hook up. For the price this brewer is on the top of the list. 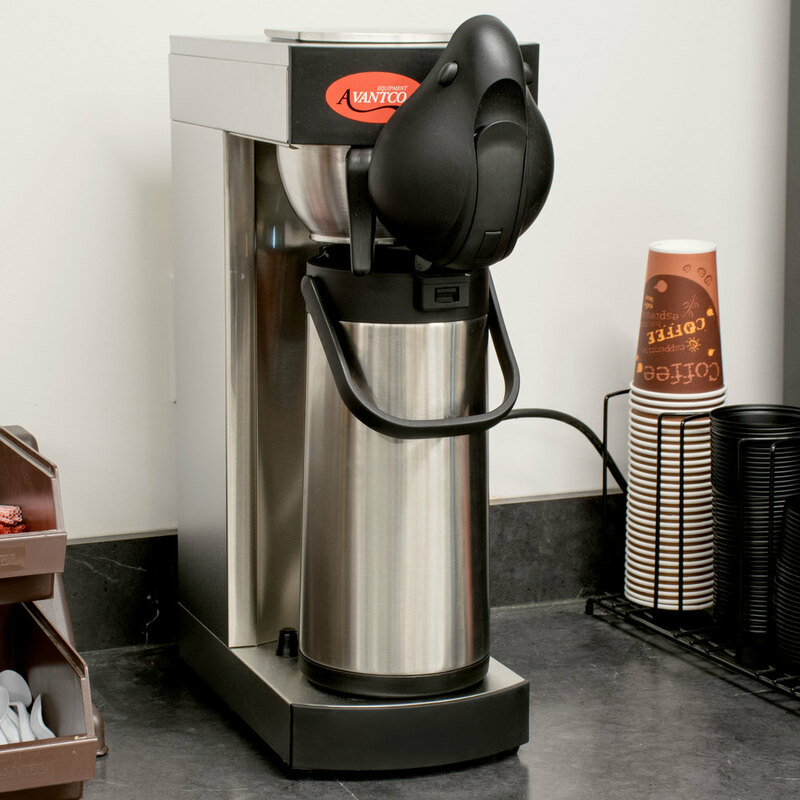 We serve 600+ tenets in the tallest building in Kansas coffee every morning, It takes approximately 7 minutes to fill one air pot. The simplicity and quality of the drip allows you to adjust the size of your grind to meet your taste. It does leak if you pour the water in too fast but other than that I would recommend this over any of the fancy adjustable ones on the market. Spend your money on the bean not the brewer. This brewer is definitely great value for money. It takes up minimal space, in fact half the space that my older one used to take up (Which I paid a lot more for) I find it brews a perfect pot each time with no issues. The only small problem I have with it is that it does leak if it tilts a bit while putting it away. I run a craft service food truck for the film industry so I have to stow it away when we move sets. This brewer has become the core of our service program. We brew a lot of coffee and are currently running two of these units simultaneously. At 12 min/pot average brew time, we can keep up with demand. I chose this brewer for its price and ease of use. We are primarily using these at outdoor markets and special events and the lightweight design makes transport easy. I prefer the all stainless steel look and the SS filter basket is great for easy cleanup. I bought this for my drip coffee at my coffee shop - I have used it about 6 times a day for a couple months now and it works great! I bought the pour over because of the price and it is easy to get used to. Makes great coffee!! Bought this brewer for use at church, brewing coffee on Sunday mornings and special events. We brew 2.2L airpots and it takes about 5 mins. Not super fast, but works well and is built pretty decent. After using his model in our family bakery last year, I knew that this was the only coffee brewer to go with when choosing something high quality for the office. We used to use a single cup brewer, but that was expensive and bad for the environment. 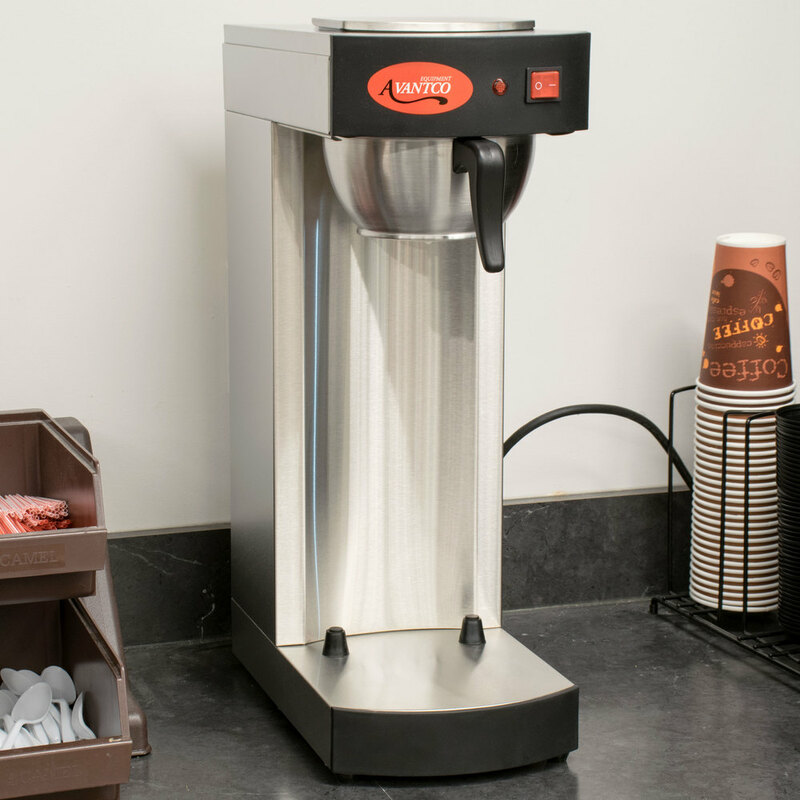 Now, we can brew 10 cups for the price of one K-Cup and with our airpots, the coffee stays hot all day long! This also allows us to brew an extra pot to put in the fridge and use for iced coffee. While this is for restaurants, this makes a GREAT addition to our office of about 25 people. You can't go wrong with this coffee maker. 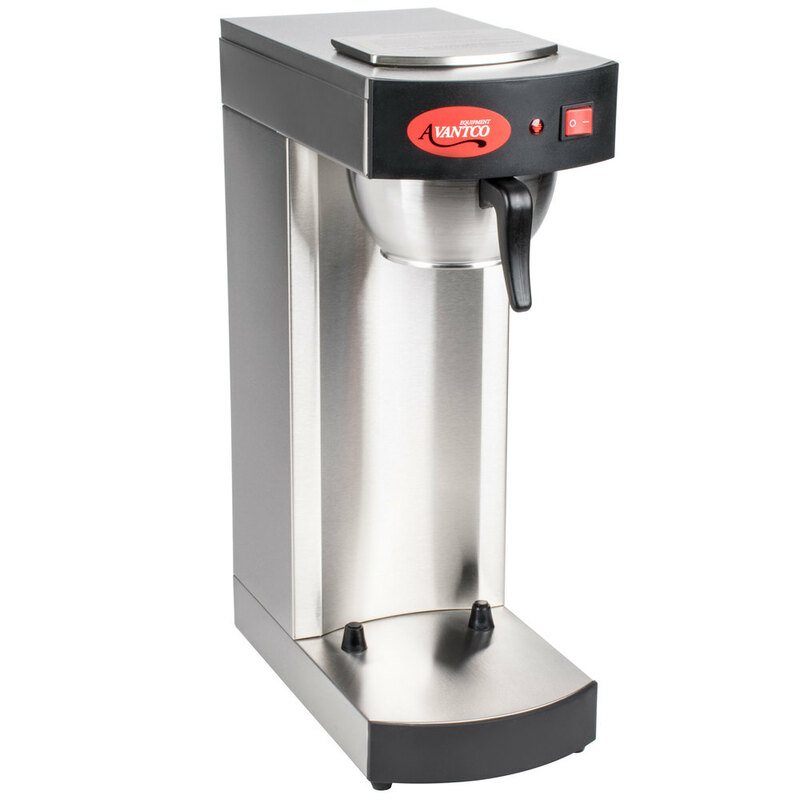 We are using these coffee makers to serve coffee at our church gatherings, Excellent quality and value. It takes about 4 minutes to brew a carafe of coffee. This little airpot brewer is just what I needed for my mobile coffee business. It's easy to use and clean, lightweight for transport, and brews well-extracted coffee every time. At this price point, it's easy to buy several if you've got a coffee shop that has more of a demand for endless drip coffee. It makes great coffee fairly easily, but it ends there. The airpots that are recommended are just a tad bit too tall for the unit. When you open them and try to put them under the basket, you can't. You have to fill the basket with coffee and slide it into the supports at the same time the choice airports are placed underneath. This isn't too tough, but when you are sliding them out, you have to follow the same procedure. So now you have a hot basket full of steaming grinds and a full airpot with steaming coffee to handle. Either buy a smaller airport, or a different brewer, but these two really aren't compatible. We use the 2.5L Choice Airpot that are recommended with the product on this site. This brews adequate coffee, but it is too slow for commercial use, and does not heat water into the optimal brewing range. Also, it arrived with a small bent part in the brewing basket, and the vendor was unable to send me a replacement part, unless I sent the entire unit back. I will be selling this brewer, and going with something that is faster, hotter, and provides a more complete extraction. This thing is a workhorse in our tech shop. It's always cranking out fresh coffee without a wimper or an issue. Great pourover machine for a great cost. We definitely were excited to get this brewer for our coffee shop and it more than meets our expectations. And doesn't take up a lot of counter space! This is a nicely priced airpot coffee Brewer. It brews coffee quickly and it tastes great. Only downside is that you need to order the water jug seperate. It doesn't come with one.